King Cobra is a Cannibal snake feeds exclusively on other snakes including venomous snake species and own cobra species. The world’s longest venomous snake is the only snake species makes a nest for her eggs and stays with the eggs and guard. King Cobra lives in dense forest and highland forests of South India, near by the lakes and streams. 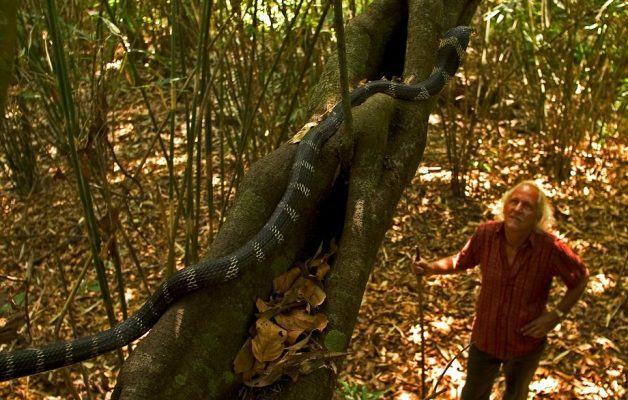 The Agumbe Rainforest in the Western Ghats is the best place in India to spot wild King Cobra’s and also has Agumbe Rainforest Research Station founded by Romulus Whitaker. As the King Cobra Ophiophagus hannah is a snake eater species,its diet consists primarily on rat snakes,other true cobras, the krait,pythons,other venomous snakes and also prey on small mammals,rodents,birds and lizards. The King cobra feasts on its own kind as well including another male king cobra and female king cobra. 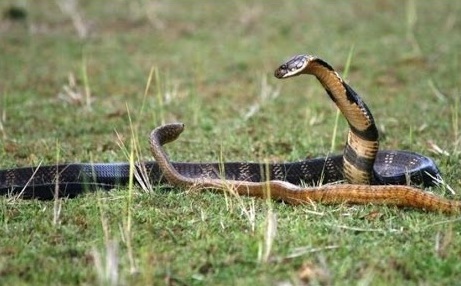 The King has unique behaviors among the other snake species such as builds nest,diurnal hunter and detect moving prey from a long distance. 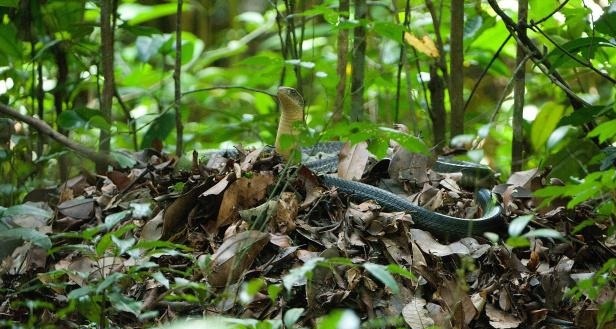 Agumbe Rainforest Research Station has witnessed rare behavior of King Cobra, A male king cobra killed a pregnant female King Cobra in Agumbe Rainforest. The King Cobras do not have many natural predators but have very few predators such as mongooses,large birds of prey and human. Ophiophagus hannah hunt and killed by Mongooses and sometimes picked by large Indian birds of prey such as Golden Eagle, Snake eagles and Serpent Eagles. King Cobra is the sole member of its own genus, Here is the list of 5 Places to Spot Cannibal King Cobra in India.